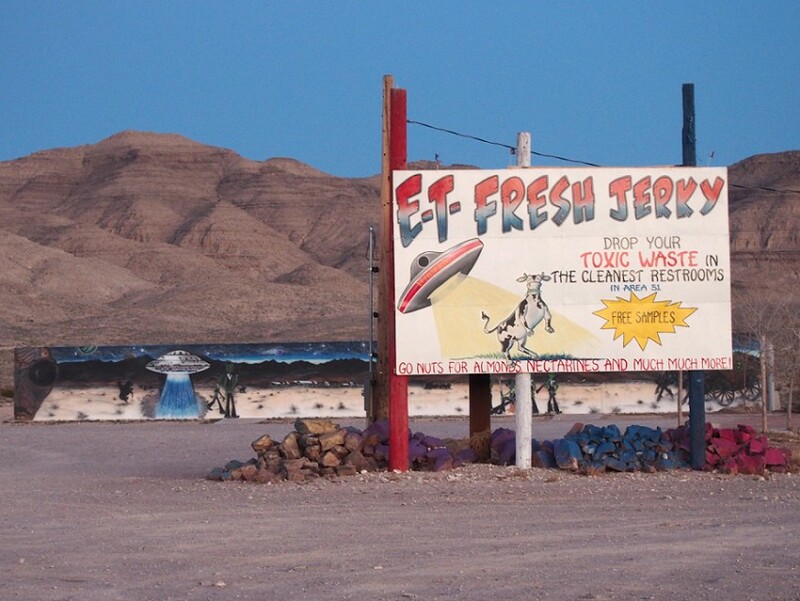 March 8, 2015—I was standing in a beat-up diner surrounded by alien memorabilia out in the Nevada desert asking a woman in an apron about the location of a classified military base rumored to be harboring the answers to the deepest mysteries of the universe. This is how I got there. It’s not a question the likes of me should ever be able to ask were the events of human history not seasoned with the bizarre. But it is, and I did. 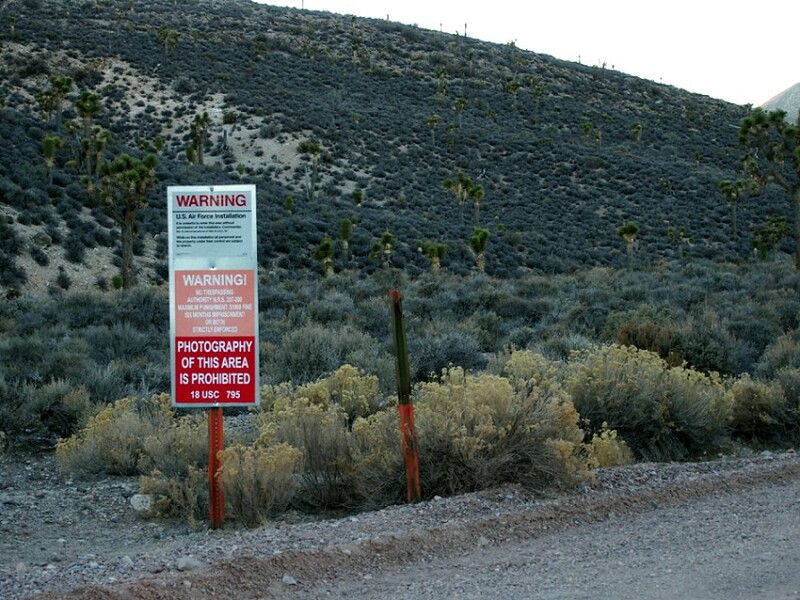 The real-life military facility that is Area 51 has become an absolutely mythical place. 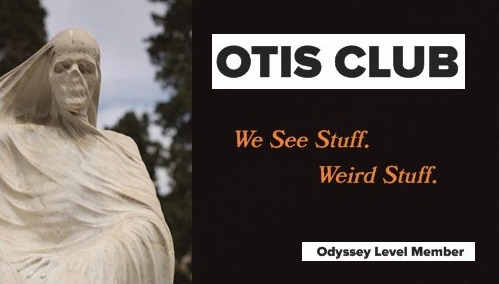 You can’t dig into anything ET without stumbling over the otherwise bland designation. The basic mythology goes like this: In 1947, an alien craft crashed in nearby Roswell, New Mexico. 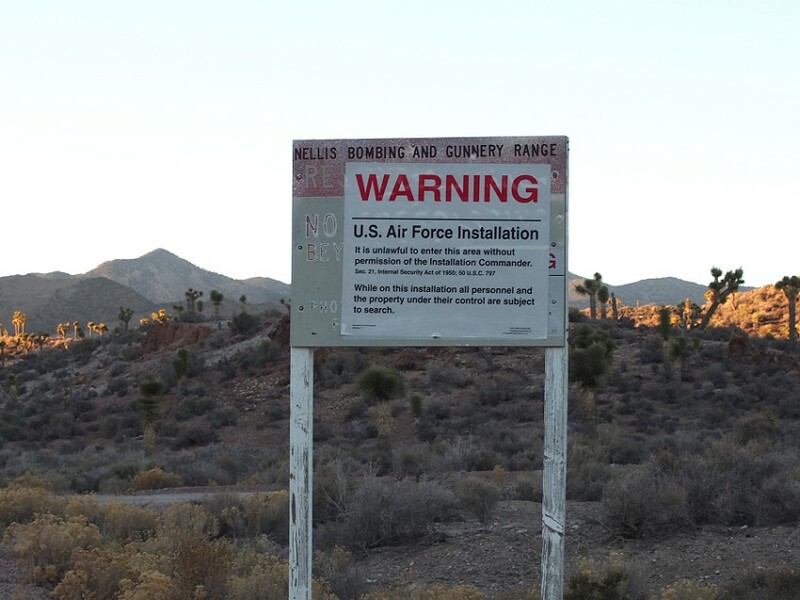 The wreckage and the bodies (or survivors) were sent to Area 51, where the advanced technology was reverse-engineered and implemented into U.S. military aircraft. You don’t think we came up with the F-117 Nighthawk stealth fighter out of thin air, do you? There are other science fiction rumors and stories about the place, but that’s the backbone they’re kind of all hung on. The truth is more parochial. Probably. Area 51 and the other Air Force facilities in the general area test advanced jets. Because advanced jets have to be tested. And, often, they need to be tested in secret. It’s not their fault that the Barbara Streisand Effect put little green men all over their runways. Although some say the alien stories were created by the military itself to hide the real goings-down at the base. Why not. Regardless, the story is awesome, and I wanted to be close to it. 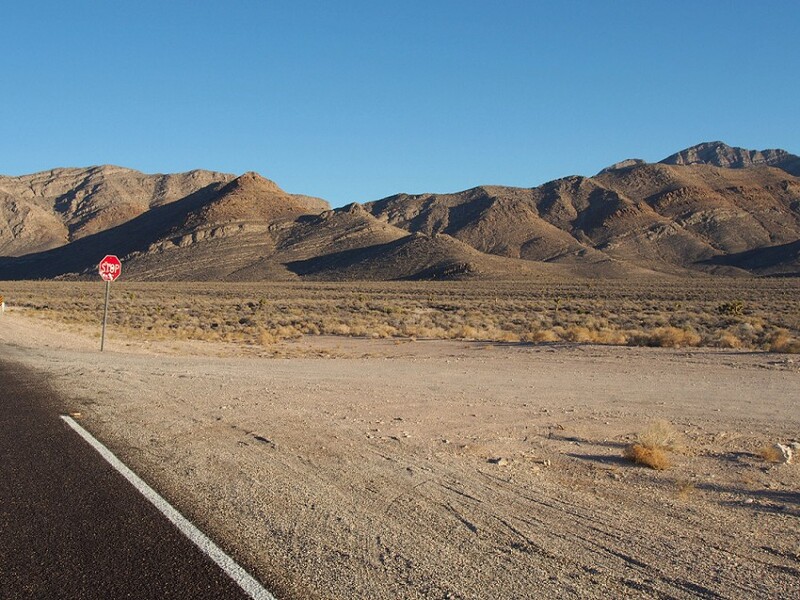 I had to ask directions because the ones I found online were pretty vague, basically just telling me that Area 51 was on a dirt road off the Extraterrestrial Highway. 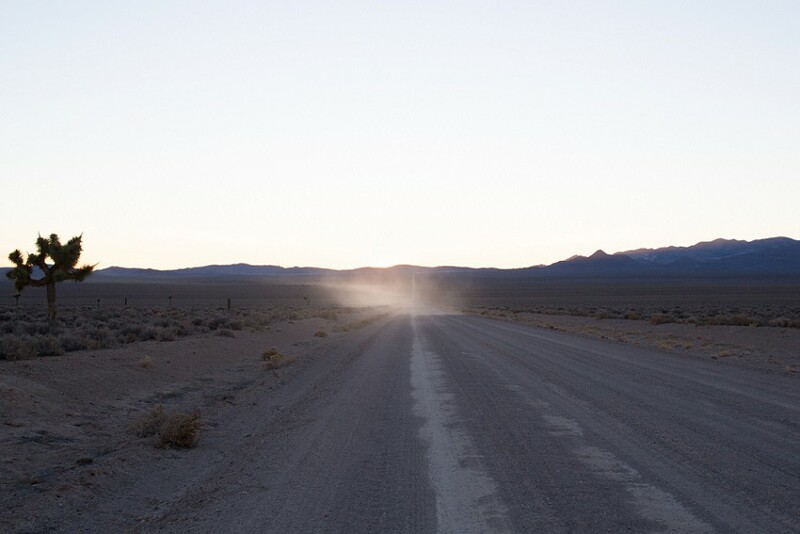 Turns out, there are quite a few dirt roads off the Extraterrestrial Highway. I’d actually jumped on one of those dusty trails north of Rachel prior to arriving in the town, but after ten extremely slow minutes of creeping down the dirt road in our rental van, I lost my confidence and we returned to the main road. That’s how I remember it, anyway. Missing time could have been at play. I assume that was the road I’d originally taken, but hitting up the front door sounded like what I wanted to do. She gave us directions down to the mile marker, and I thanked her. But like every good harbinger, the directions came with a warning. That wasn’t just a story to thrill the tourists. I’d read accounts attesting to the fact, and there’s even a great video from last year of one alien-themed tour operator absentmindedly driving his group right past the signs. We drove for 25 miles south of the Little A’Le’Inn, where we encountered a dirt road with a stop sign. No directions I’d read said “Turn at the stop sign,” nor had Pat told us that. Seemed like the right place, though, because the stop sign was covered in stickers just like the Extraterrestrial Highway signs. I have no idea why the Powers-that-Hand-Out-Stop-Signs thoughts this intersection needed one. Until recently, the intersection was also the site of the infamous Black Mailbox. This is exactly what it sounds like. Except it’s white. When it was there. For decades, people used the mailbox as a meeting point to sky watch because it was the only thing around for miles. But they also rifled through the mail looking for military secrets and stuck Christmas cards to ALF in it. Sometimes people would use it for target practice. It was actually the mailbox of a local cattle rancher named Steve Medlin. In 1996, after getting tired of people tampering with his ValPak coupons, he replaced the original black one with a blocky, white mailbox that was bulletproof and padlocked. Even added a second box where people could stick in alien-related stuff. 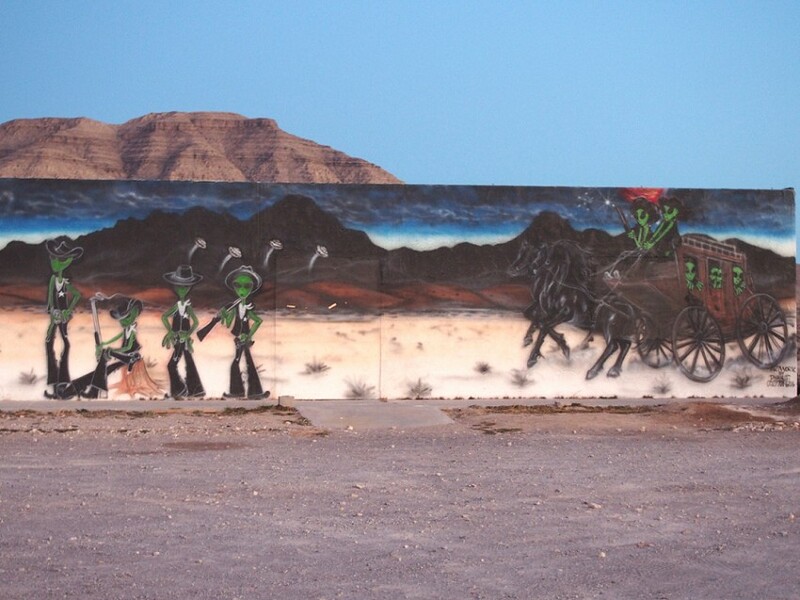 As seems to be the way on the Extraterrestrial Highway, the box was quickly covered with graffiti and stickers. In 2014 it disappeared. I guess he just got tired of having a famous mailbox. And one day the Little A’Le’Inn will close and Area 51 will be divvied up for condos and our children will be an impoverished lot as a result. Even though the road was unmarked, my GPS named it Groom Road. Makes sense. Area 51 is on Groom Lake, a salt flat somewhere out there. Much of Groom Road cuts through public land, which is why the whole place isn’t gated at the highway turnoff. 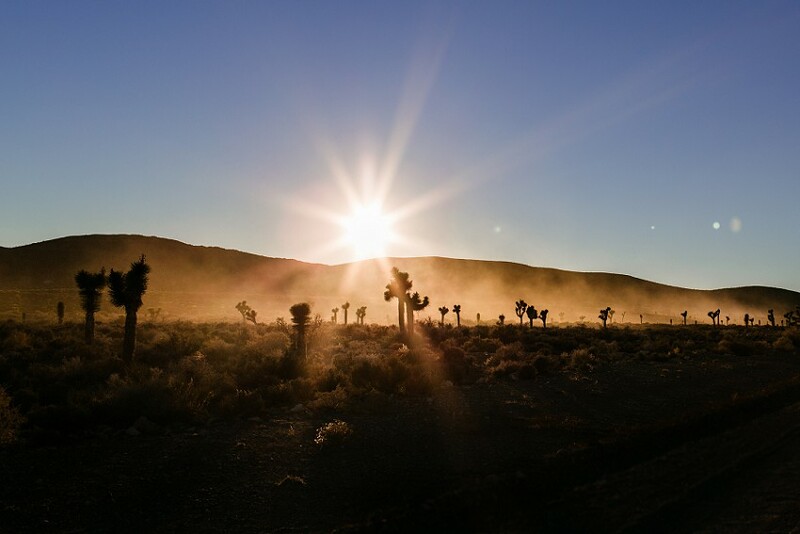 The road was decently maintained, but we still had to take it relatively slow as we kicked up a massive cloud of dust among the cacti as the sun got closer to the horizon. Another thing I was worried about. I didn’t want to be inching up to an invisible line after dark. In the distance we could see another shimmering dust cloud from another vehicle, whether coming or going, we couldn’t be sure. Pat had told us the No Trespassing signs that marked the edge of the base were 14 miles down that dirt road. I was extremely grateful she gave us the exact mileage, because the pace and the isolation and the anticipation stretched that line of dirt into a forever-drive. If I didn’t have something to track on the odometer, I might have given up too early. 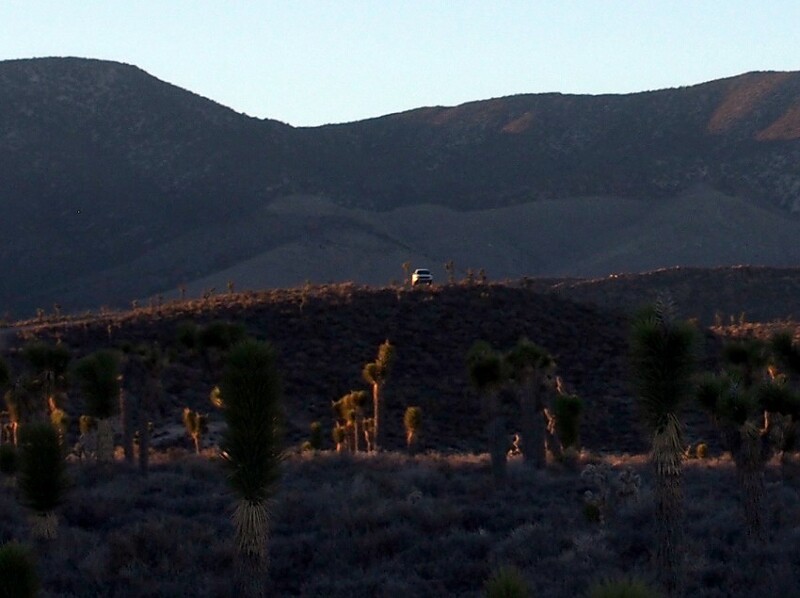 But you can see the entire length of those 14 miles across the flatness of the desert. Where the road disappears around a bend is where the action starts. As we neared that bend, we passed a car traveling in the opposite direction. The driver flipped us a Vulcan salute, and it made me feel a thousand times better. So thank you, whoever you are. It was about that time we saw the white trucks sitting on hills on either side of the road. These were the guards. Photographs and testimony I’d seen online revealed them to be dressed in camouflage and toting terrifying automatic weapons inside those white metal carapaces. The men in white…trucks…had obviously been watching us from the second we turned onto Groom Road, but this was our first sight of them. The trucks just sat there, all glinty in the low sun, the drivers, I assume, bored and disgruntled enough to hope we’d cross the line. After all, all their friends were back at the base dissecting aliens and stuff. And then we saw the warning signs. Simple red and white placards on one each side of the road, forbidding entry and threating six months in jail, a $1,000 fine, or both. The invisible boundary stretched between them. I did exactly what Pat told me to do and turned the van around. I also made sure that my five-year-old stayed in the van. Just didn’t trust her Imp of the Perverse. I got out of the car and walked up to the signs to get pictures, making sure I gave myself a good ten feet of buffer and wondering why they wouldn’t just put a freaking gate up. It’s almost like they want you to have the thrill. Like they’re part of some vast tourist conspiracy to flow tourist money into this empty little county. I snapped a few photos. And the truck to my right started moving. It suddenly occurred to me that the signs didn’t say “No Photography Beyond This Point.” Instead, the exact language was “Photography of This Area Prohibited.” And I had in fact, just taken photos of the area. I turned my back to the trucks and started walking toward my wife, who had also gotten out of the van. I explained to her what I’d just realized and, as I was walking, started to slip the memory card out of my camera. They could confiscate the camera, my car, my license, but goddamn if they were going to take my memories of the Clown Motel. My wife kept looking over my head at the truck on the hill. Finally, she smiled. “Looks like they’re just turning around.” I immediately felt a mixture of relief and disappointment. I’m not sure what that latter was doing in there. We took some more photos and then left. The drive back was exhilarating. 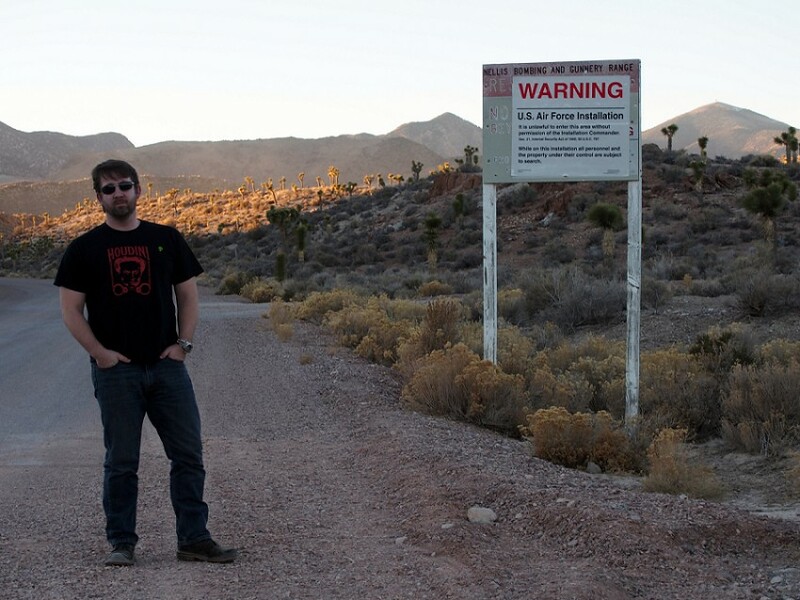 We had played chicken with Area 51 and survived. By the time we hit the asphalt, dusk had deepened. We continued south on The Extraterrestrial Highway, and there at the end were two alien-themed attractions that were closed. 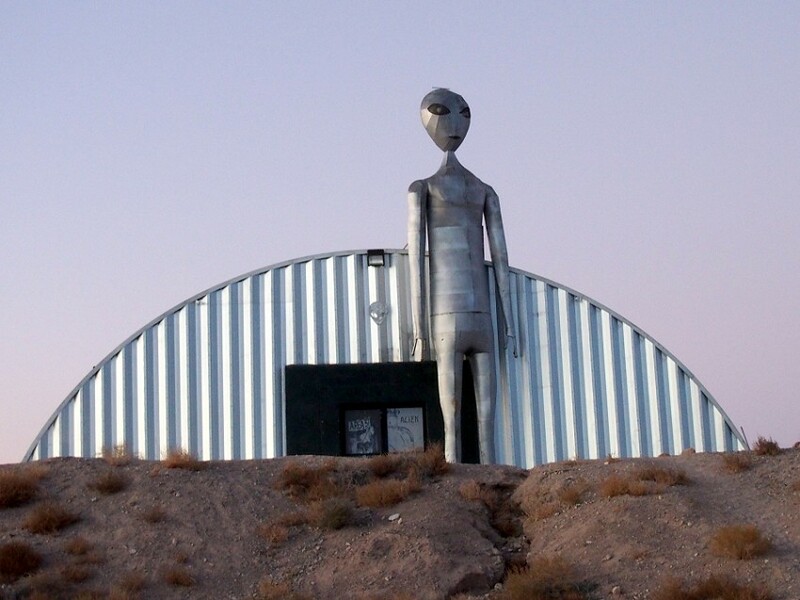 One had a giant metal alien in front of it and called itself the Alien Research Center. The other was an alien-themed jerky store complete with a building-sized mural of aliens in cowboy get-ups. Our euphoria over Area 51 took us easily past that disappointment, but then my GPS piped up. “Turn left onto US 93 South.” It was the most depressing thing my GPS has ever said to me.